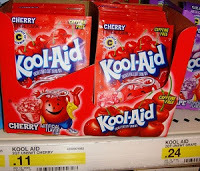 Right now there’s a $0.50/5 coupon on Koolaid’s Facebook page. Below are the steps to print the coupon and a deal at Target that makes the Koolaid packets only $0.01 each. If you don’t live near a Target, print off the coupon anyway, because Kool-Aid usually goes on sale for $0.10 at many stores. Final Price: $0.01 each when you buy 5!